You've upgraded to windows 10 and are really enjoying it. But are you making the most of the visualisations it now provides you? 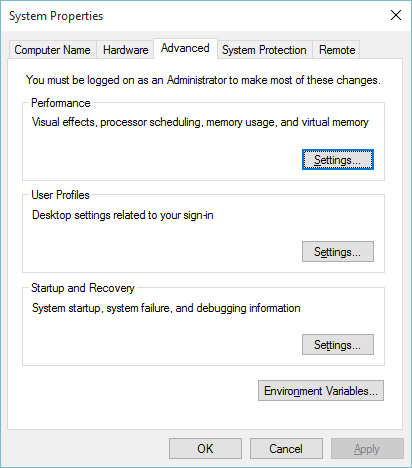 Since Aero came onto the scene in Vista, Windows has leveraged your graphics card to add heaps of whiz-bang effects to windows. Transparent windows, animating transitions and other such visual effects. With Windows 10 we have new ones, such as the multiple desktops transition, and the new interpretation of the task switcher labeled Task View. Luckily there has also always been a way to customise how little, or how much of the animations you want to see or use. To find the settings related to the animations, first you need to open System Information. This can be done by typing System into search. Or more simply, use the keyboard shortcut Winkey + Pause (Pause is found near the Print Screen or scroll lock buttons on most keyboard I have used). 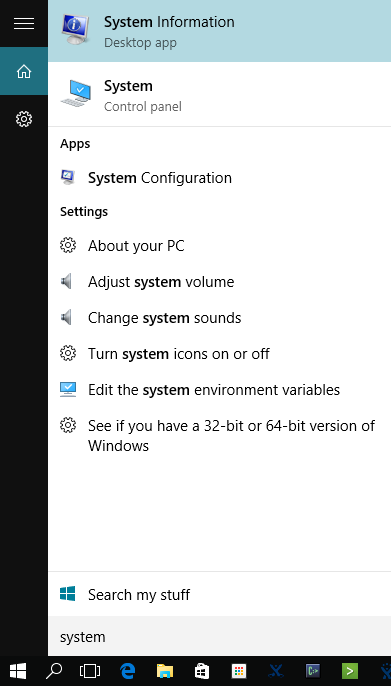 From here, simply click on the Advanced system settings button on the left. This opens the System Properties dialog. Navigate to the Advanced tab. Click on Settings in the Performance section. This is where we can customise the Visual Effects of Windows. Windows might think it knows best and have turned off settings that your graphics setup cannot handle. Either setting could be completely unavailable to you, or you might start getting performance issues by turning some of these on. There, I've warned you. Tweak the settings to your hearts content. You really want to see the animations, but they don't seem to be currently on? 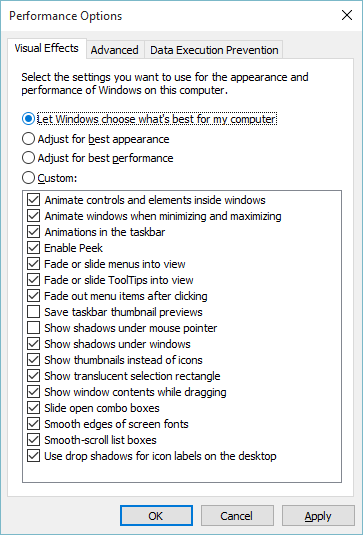 You might have Adjust for best performance or Let Windows choose what's best for my computer selected. Choose Adjust for best appearance and animations will be turned on. Still not happy with this, you can use Custom and selectively turn on the ones you want. If you sincerely despise the animations windows throws at you, you are in luck. This is configurable. You may currently see Adjust for best appearance, or Let Windows choose what's best for my computer. Just change this to Adjust for best performance and there is a good chance all the check boxes become unticked. All your animations will now be turned off. You may want to choose Custom and start selectively turning off the ones that really annoy you, and leave the rest on that make sense to you. As mentioned above, there is an option Custom. This lets your turn on and off specific OS animations. For instance Animate windows when minimizing and maximizing will turn on the transition for windows as you minimise and maximise them to the system tray, but also controls the multiple desktop transition left and right. For the best balance, you can turn on the ones that work for you, and turn off the ones that don't. Customising these will give you the best experience for you and your machine to balance the power of the machine, against your tolerance or preference to the animations and transitions.